The photovoltaic solar-panel array at Kibbutz Ketura is the first and currently only of its kind in Israel. KIBBUTZ KETURA, Israel — During the first ever Passover we left Egypt and slavery, celebrating our freedom in the wilderness. It’s easy to forget that back then this stretch of the Arava Valley, a half-hour up the road from the hotels of Eilat, wasn’t part of the biblical Promised Land. No, this part of southern Israel was wilderness — our ancestors wandered through here after the Exodus. It was here, in the desert, where we gained our freedom from slavery to Pharaoh. But that was more than 3,400 years ago. Today, this part of the wilderness is a global center for solar-energy research. And today, it is here in the desert where we are gaining our freedom from slavery to fossil fuels. Solar companies from all around the world send prototypes of new solar panels to be tested here, home to the highest levels of solar radiation on the planet. Think of it as a photovoltaic Big Apple: If solar panels can make it here, they can make it anywhere. A few steps away from Methuselah — the tree germinated from a 2,000-year-old Masada date pit by Arava Institute researcher Dr. Elaine Soloway — the future of clean, renewable energy is getting a test run. Dr. Tareq Abu Hamed of the Arava Institute and William Weisinger of Israel’s AORA Solar are testing solar panels with new self-cleaning electrodynamic screens (EDS), designed to help keep dust off the panels. Dust can sap five percent of a solar panel’s efficiency, but EDS essentially uses an invisible electric broom to sweep off the dust, brushing away dust particles with an electric field that moves across the panel. Another solar panel being tested here at Ketura is the bifacial solar cell, developed by Israel’s bSolar Ltd. Basically a double-sided solar panel, the bifacial system takes advantage of the sunlight that strikes the ground and bounces back toward the sky, allowing bifacial cells to capture about a quarter more energy than conventional photovoltaic cells. 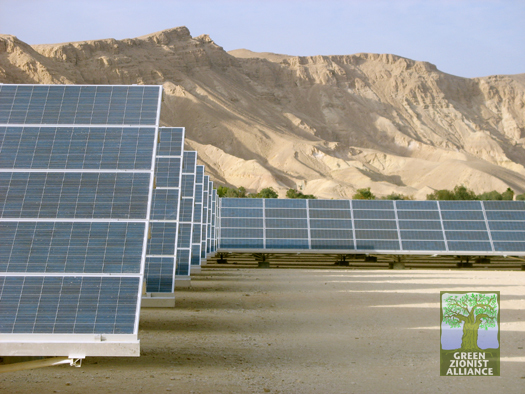 Just south of here and adjacent to the kibbutz is Israel’s first and only photovoltaic solar-energy farm, operated by the Arava Power Company and producing five megawatts of electricity. But that’s not enough. Less than one percent of Israel’s electric grid is powered by clean, renewable energy such as solar. Fortunately, the country is getting ready to increase that amount as it prepares to reach its goal of 10 percent of its grid energy coming from renewables by the year 2020. Ketura is going to have some company: Last month the government issued 19 licenses for photovoltaic farms that will generate a total of 27 megawatts. Not to be outdone, last week the Arava Power Company announced plans to build a new solar field here with a capacity of 40 megawatts. As a basis of comparison, Eilat consumes about 120 megawatts of electricity. The government also has approved a 60-megawatt thermal-solar facility outside Kibbutz Mashabei Sadeh and a 120-megawatt thermal-solar farm by Kibbutz Zeelim. Whereas photovoltaic-solar panels directly convert sunlight into electric energy, thermal-solar panels concentrate the sunlight on a central source, heating water into steam in order to turn a turbine. The process is similar to conventional fossil-fuel energy production, except because the raw material is sunlight and not coal — the largest source of Israel’s electricity — thermal-solar energy is pollution free. Theordor Herzl dreamed of an Israel powered by clean, renewable energy and, specifically, not coal. Instead Israel’s powered by coal, the dirtiest of fossil fuels, and a large contributor to poor air quality in Israel’s largest cities. The effect? More people die from air pollution in the Tel Aviv metropolitan area alone than die from terrorism and wars combined, according to the World Health Organization. When the world frees itself from dependence on fossil fuels, it will be using solar technologies developed here at Ketura. And this Passover, Israel’s taking a step closer to freedom from the polluting tyranny of fossil fuels. This year, there’s more solar power planned for Eilat. Next year in Jerusalem.